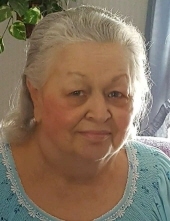 Patricia Elaine Olsen, age 75, of Wheatland, passed away Friday, March 22, 2019 at her home surrounded by her family, after a long battle with cancer. On September 9, 1995, in Antioch, Illinois, Patricia was united in marriage to Dean Olsen. Patricia has been a resident of Wheatland for 25 years. She was a homemaker and cared for her grandchildren. Patricia is survived by her husband, Dean; children, Ronda (Dave) Frook of Salem, Renee (LeRoy) Boss of Nashotah and Marcy (Ken) Penge of Salem; daughters-in-law, Marina McCawley (widow of son Ron) and Kim McCawley (widow of son Rob); grandchildren, Brandon, Brett, Courtney, Dustin, Devin, David (Jess), Ryan, Michael, Samantha (Justin), David “DJ”, Adam (Nikki), Matthew (Tiffany), Stephanie, Jennifer, Nickolas and Anthony; great-grandchildren, Jase, Easton, Savannah, Sierrah, Siennah, Sawyer, Sophia, Landon, Braelynn, Michelle, Kurtis, Ethan, Aviana, Gia, Richie, Logan and Emma; and siblings, Helen Kislia of Lake Zurich, Illinois, Joyce (Gary) Cooper of Hixton, Wisconsin, Butch (Georgia) Beebe of Rockton, Illinois, Stan (Kathy) Beebe of Beloit, Wisconsin, Kerry (Bob) Utter of Berlin Heights, Ohio and Rosie (George) Kraft of Beloit, Wisconsin. She is also survived by many nieces and nephews. She was preceded in death by her parents, Ken and Melva Beebe; first husband, George McCawley; sons, George “Ron” McCawley and William “Rob” McCawley; and granddaughter, Cassidy McCawley. Services for Patricia will be held Saturday, March 30, 2019 at 1:00PM at Schuette-Daniels Funeral Home with Pastor Larry Williams officiating. Relatives and friends may visit with the family from 11:00AM until the time of service at 1:00PM. To send flowers or a remembrance gift to the family of Patricia Elaine Olsen, please visit our Tribute Store. "Email Address" would like to share the life celebration of Patricia Elaine Olsen. Click on the "link" to go to share a favorite memory or leave a condolence message for the family.